Senator Day described sections of the property industry as “carpet-bagging, rent-seeking bootleggers” who used political donations to wield ­influence to restrict land supply and drive up prices of high- and medium-density apartments. He likened the relationship between the property industry and politics as to the economic theory of the “baptists and bootleggers” of the 1920 ­Prohibition, in which both groups favour regulation for opposing reasons. “This [his political career] is more important now,” Senator Day said. The land banking formula is quite simple. Assume control of the vacancy figures. Ensure this vacancy measure only includes property available for rent. Ignore properties held for capital gains. Buy land off farmers at firesale prices outside the Urban Growth Boundary. Hoard land inside it. 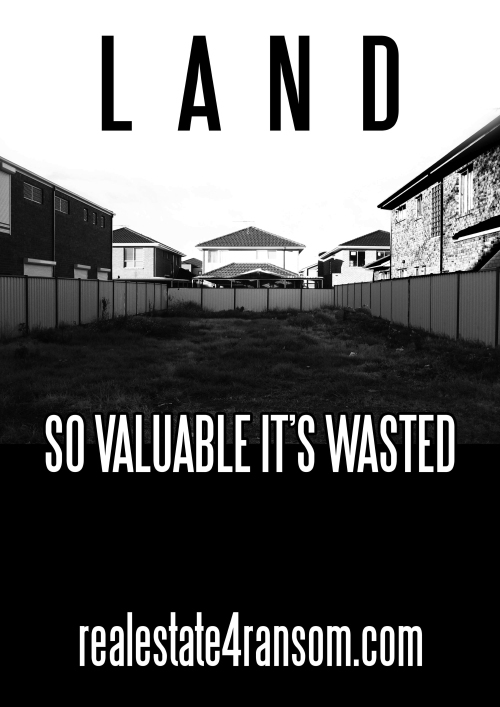 Shriek at the Victorian State government – ‘all affordability needs is more land’. The formula then requires a push for the re-zoning of said farmland, with that golden bureaucratic pen tick promising so much. 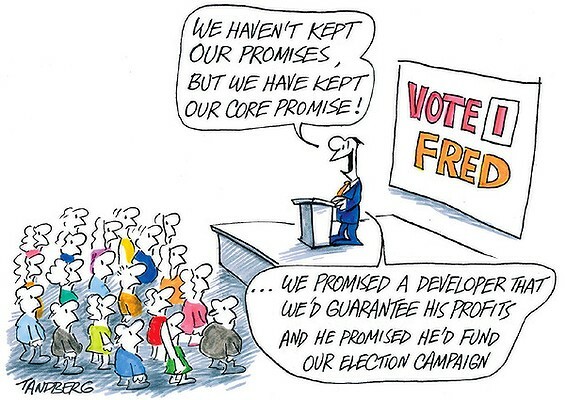 Ensure the local council is dominated by developer friendly interests. Seed their company planning division with former local and state government planners. Donate heavily to state governments and politicians. Cartoon – Tandberg, courtesy of The Age. In his submission to the Senate’s housing affordability inquiry – which heard evidence about housing tax breaks from Treasury officials this week – Senator Day said politicians received donations from property developers keen to maintain scarce land supply, resulting in higher ­property prices. “The MPs then publicly support urban planners who rail against the so-called evils of urban sprawl, none of which stands up to scrutiny,” Senator Day said. Cloud media landscape to divert attention away from the fact investors have swelled from 12 to almost 40% of housing loans in Australia. Then drip feed the newly re-zoned land to the market. In some cases this has lasted 15 to 20 years. The formula is such that the next staged release is only liberated when an appropriate ‘demand assessment’ has been completed. This drip feeding was once known as a staged release. Perhaps the real estate for ransom mentality was too close for comfort to ‘staged hostage releases’. A new term has thus evolved – sequential development. The ACCC must investigate this land banking practice. Sequential development can be a recipe for minimal work teams – the slower they build, the more money developers make. How? As population increases and society develops, competition for prime locations is bound to increase. This is a community created economic rent. In what other industry are holders of crucial natural resources allowed to drip feed these building blocks of life to the market in order to push prices ever higher? It’s as if we are permitting water barons to turn our taps on and off unless we pay higher and higher prices. A fairer system would see these large landholdings broken into smaller allotments to reduce market power. One recent development allows 17,000 re-zoned sites to just one developer. Beyond such regulatory control is a taxed based answer. A higher Land Tax will ensure competitive pressure is placed on landholders to put sites on the market as soon as possible. The current cost pressure is something like $5,500 (in council rates and Land Tax) versus capital gains of $30,000 p.a per lot. There is no doubt the current Land Tax system needs reform. It must be pushed higher, flattened and have a lower land tax threshold. These revenues can be used to replace the damaging developer charges that are passed on to first-time buyers, resulting in huge interest costs. Stamp Duty must go. The local council also suffers – Developer Contribution payments can be spread over 30 to 50 years, whilst the council stretches to provide infrastructure immediately. Victoria’s Growth Area Infrastructure Charge should be culled in place of this fairer form of taxation. Let’s hope more politicians come to realise the incredible pressure housing is placing on society. This must happen quickly as the next financial derivative – Rental Backed Mortgage Securities – is already seeing the locked out Renting from Wall Street. The US market for RMBS has quadrupled in just eight months. That a household needs to earn $150,000 per annum to have any breathing room is an indictment on the so-called Great Australian Economic Miracle.